Translator, Upper Division Clerk, Stenographer, Lower Division Clerk, Librarian jobs. Total KVS Non Teaching vacancies available in this Kendriya Vidyalaya Sangathan KVS Recruitment are 1017 posts. Eligible candidates have to visit the KVS official website www.kvsangathan.nic.in and apply for Librarian, LDC, UDC, Stenographer and other jobs. Last date to send KVS online application forms is 11-01-2018. KVS Librarian, LDC, UDC, Stenographer jobs selection is based on Computer Based Examination and Interview. 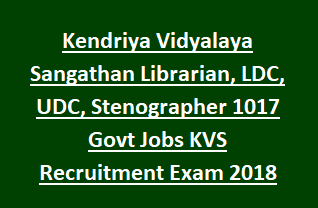 For more details of Kendriya Vidyalaya Sangathan KVS Recruitment of 1017 Librarian, LDC, UDC, Stenographer govt jobs Notification dates, Application procedure, Exam pattern & Syllabus, Test centre and dates are given below. Librarian: Graduate with 01 year Diploma in Library Science or Bachelor Degree in Library Science. Must have knowledge in computer applications. Lower Division Clerk: XIIth class pass and having typing speed of 35 WPM in English/ 30 WPM in Hindi on computer. Assistant Commissioner: Master Degree with minimum 45% marks, B.Ed or equivalent degree. Upper Division Clerk: Graduate with 03 years experience as LDC. Go through the KVS Notification qualification details of other posts. KVS selection authority will select candidates for LDC, UDC, Assistant Commissioner jobs in Kendriya Vidyalaya Sangathan Recruitment based on Computer based exam and Interview. KVS recruitment Exam pattern and syllabus for each post are mentioned in the notification. Candidates with the above eligible criteria are required to visit KVS website www.kvsangathan.nic.in. Online application forms for each post will accepted from 21-12-2017. Closing date for online registration is 11-01-2018.